A dreadful canker on the South Bank, the giant purple Udderbelly cow is currently visiting London before it floats back north to Edinburgh and its first home, the Festival Fringe. Alongside big music and comedy acts are the Tom Tom Crew, who had an extremely successful Edinburgh a few years ago and are touring this summer preliminary to a Fringe rerun. The Crew comprises four acrobats, a drummer, a beatboxer and a turntabulist, delivering an hour or so of spectacle that shoots for a club atmosphere and relies on a lively and vocally engaged audience. 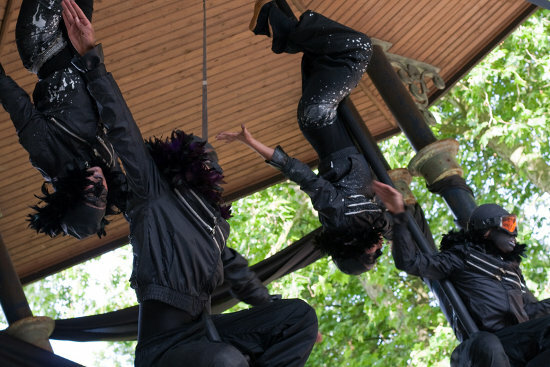 The circus performers are rotated in and out, backed by the three musicians, who each get their turns in the spotlight: turntabulist Sampology opens the show; Ben Walsh drums up, down and around on eight metal sheets arranged in an octagonal scaffolding frame; and Tom Thumb performs extensive throat-ripping vocals (in one section sampled and remixed live). It’s easy to see why it got its big break in Edinburgh, where audiences are more likely to be people willing and able to spend an hour or two getting wasted outside in the Udderbelly’s Astroturf pasture (worst ever beer garden)—and not people who’ve come straight from work. For the sober there are still some things to enjoy. I liked the scratching, Sampology's equipment filmed from above and projected large behind him—the physical dexterity needed to work the tables and controls at least as captivating as the skills of the circus performers. There’s also a fun little rap section with an 80s-era Japanese electronic harp (the Omnichord) where the manic energy of the drummer and host drops a few notches and comes closer to the mood of the audience—his friendliness seeming earnest at last. The acrobats are good at what they do—tumbling, teeterboard and straps—and it works as spectacle and excites the kids in the audience, but there’s no originality in the tricks and not a great deal of personality in the acrobat performers (even though they are introduced by name). The show as a whole has a glossy homogenised feel, which is probably not quite the fault of the Crew themselves, and is partly caused by the show's mainstream marketing of a fringe culture (and the horrible venue)—but it’s also the separation and isolation of aspects of hip-hop: the scratching is good, but no one’s dancing. A day later—in Victoria Park as part of Paradise Gardens—I went to The Silver Tree, a new commissioned collaboration between Avant Garde Dance and two Chinese Pole artists, Gemma Palomar and Telma Pinto. It was the most successful fusion of urban dance with circus performance I’ve seen—a brilliant example of two companies from different but complimentary backgrounds combining their skills without either discipline eclipsing or reducing the other. Black fabric had been roughly woven between the pillar supports of the Victoria Park bandstand, not in any pattern but creating an organic and uneven web. The dancers were costumed as birds, or as suggested birds, all in black and with odd runs of feathers—somehow also reptilian and prehistoric. The Silver Tree doesn’t carry a narrative, or not one I caught, but has satisfying rhythms of aggression and quietude, ensemble and solo work. The piece is choreographed by Avant Garde Dance’s Artistic Director Toni Adigun, although there are some of the signature tricks of the two Pole performers and spaces for them to include what is clearly their own material. I think one of the reasons that The Silver Tree succeeds, beyond the quality of the collaborators, is that Chinese Pole so well suits an urban dance crossover: the twisting in-bent movements of Pole—distinct from the more expansive circular styles you tend to find on rope and silks—seem closer to breakdancing, the artist moving often through the tight gaps between body and Pole the way breakers use their bodies to create and then thread through the smallest spaces. Chinese Pole is getting an upsurge of new material at the moment, and if The Silver Tree is anything to go by then Gemma Palomar and Telma Pinto are going to be important and original artists in the discipline.